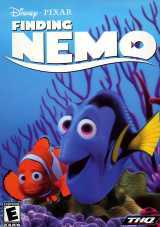 Guide Nemo and Marlin through the ultimate underwater adventure. Meet all of the great characters from the Disney/Pixar movie, Finding Nemo, as you live all the excitement of the film's storyline. The search for Nemo is on, and it is up to you to find him. Live the film through the game and help reunite Nemo and his father Marlin. There's over 15 levels of action and adventure with multiple unlockable mini-games in each level. Play as all 3 of the main characters from the film: Nemo, Marlin, and Dory. It has beautiful realistic 3-D underwater environments and you can interact with all the great characters from the film including Bruce, Crush, and the Tank Gang. It features film clips that capture the fun and hilarity of the movie.